The board of directors has begun a national search to select a new leader. Stearns has committed to continue until the new leader is appointed and up to speed. SEATTLE (January 9, 2018) – Rich Stearns, World Vision US’s longest serving president, announced to staff today his intention to retire, initiating an orderly leadership transition process which will take place over the course of 2018. The board of directors has begun a national search to select a new leader. Stearns has committed to continue until the new leader is appointed and up to speed. The board has retained the services of Carter-Baldwin, an executive search firm that specializes in Christian ministries. Carter-Baldwin is embarking immediately on a search process which will consider both internal and external candidates. This announcement comes at an important time in the organization’s 67-year history. Under Stearns’ leadership, the organization just completed a year in which World Vision provided $20 million more to help children and families than it did a year ago. World Vision and its two million supporters, child sponsors and partners appear to be on track to achieve their bold vision of helping 30 million children by 2022. “Achieving this goal will be ‘job one’ for the next president of World Vision U.S.,” says Stearns. Stearns joined World Vision U.S. as its fifth president in 1998 after a successful 23-year corporate career. Through such previous roles as CEO of both Parker Brothers Games and Lenox, the fine china and crystal company, Stearns came prepared to lead the organization into a season of dramatic growth and improved operational efficiencies. During his presidency, the organization’s annual revenues grew to over $1 billion as it expanded its work to serve even more children. Among Stearns’ greatest contributions are his urgent calling to the church in America to respond to the global AIDS pandemic in the early 2000s and the widespread influence of his first book, The Hole in Our Gospel, winner of the Evangelical Publisher’s Association Book of the Year award in 2010. 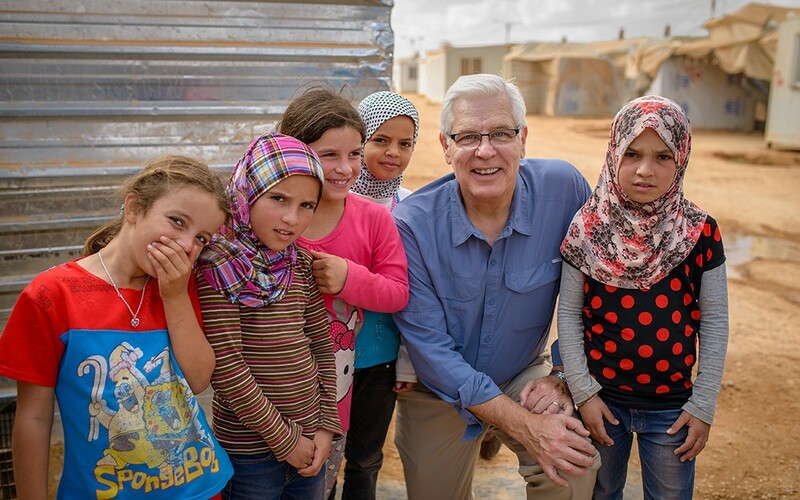 In recent years, Stearns has boldly called the church to engage in the global refugee crisis and to follow Jesus into the most difficult places in the world to alleviate human suffering and care for the world’s most vulnerable children. Rich and his wife, Reneé, have been supporters of, and passionate advocates for, the work of World Vision for more than 30 years. “We will always be a part of the World Vision family,” said Stearns. World Vision is a Christian humanitarian organization conducting relief, development and advocacy activities in its work with children, families and their communities in nearly 100 countries to help them reach their full potential by tackling the causes of poverty and injustice. World Vision serves all people regardless of religion, race, ethnicity, or gender. For more information, visit www.worldvision.org or follow on Twitter @WorldVisionUSA.